The Port Bouvard East Port Foreshore was the first major project undertaken by Tranen. 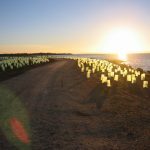 During the construction of the Dawesville Channel in the early 90’s over 4.5 million cubic metres of spoil was dredged and placed along the foreshore of adjoining areas within the Peel Harvey Estuary. Tranen were engaged to stabilise and rehabilitate 5 ha of this foreshore. Rehabilitation works commenced in 2003 and the site was handed over to the City of Mandurah in 2007. Now some 10 years after completion, we thought it time to revisit the site to see how it had fared in the longer term. Given what the site was to what it is today, we are very pleased with the results and the fact that they have withstood the test of time.